Is there an overview calendar available? 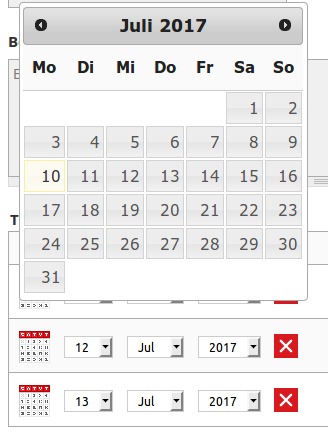 Click on the calendar symbol to choose a day for a date proposal and see the day of the week. Is there a note area? While scheduling, a note area tab was visible (until 25.5.2018). What was it for and is there a replacement? The note area was intended for the collection of agenda items or generation of a common protocol during a meeting or telephone conference. Basic data protection regulation cannot clearly regulate if the note area contains additional personal or sensitive data, for example in a protocol. The Federal Ministry for Digital and Economic Affairs has therefore deactivated the creation of new note pages within TERMINO as a precautionary measure. If you need to provide a common note page for the participants of a meeting, there are various other options. What happens if the fixed date changes? The new appointment can be re-sent to the participating persons. Some programs, e.g. Thunderbird, point out appointment conflicts and allow the update of the appointment. What is a hidden meeting poll? When creating a poll, there is a "Hidden" option. What does it do? In a hidden poll, participants cannot see what others have chosen. This can be used, for example, in a larger poll examining possible dates for an event. Can I use TERMINO completely anonymously? Both the registration of a user account and entering an e-mail address for polls is optional. This means that participants in a vote can use it completely anonymously. However, inviting persons are obliged to provide an e-mail address, so the link for subsequent editing and fixing of the appointment can be received. Why is an e-mail address necessary? Why does it make sense for both inviting and invited persons to enter an e-mail address and what is it used for? For inviting persons, the e-mail address is necessary to send them the link for subsequent editing. It is not mandatory for participants to provide an e-mail address, but recommended. The fixed appointment will then be sent to this address as an ICAL file so that the appointment can be conveniently imported into the participant's own calendar. In both cases the address will never be publicly displayed, and will only be used to deliver this information. What happens if a participant in a poll enters an invalid email address? If the address is not valid, the ical (calendar) file cannot be delivered upon completion of the appointment voting. Affected participants may not know anything about the fixed appointment. When I create or close a poll – why does it take some time until I receive the corresponding mail in my inbox instantly? Depending on whether or not your own mail service provider uses Greylisting, the delivery of mails can be delayed by a few minutes or up to 1/2 hour. If the mail does not arrive immediately, just wait a little. Who is entitled to subsequently edit or delete the answers of the participants? Logged in users may edit or delete their own answers. Anonymous users cannot edit or delete answers. This applies to inviting persons as well as to participants – it is not possible to modify answers anonymously. Registered appointment creators can delete individual appointment entries, e.g. if a user has voted several times by mistake (if, for example, the internet connection has been interrupted). Do I need an extra GDPR agreement? Is a contract processor agreement according to the basic data protection regulation necessary for companies or organisations in Austria that use TERMINO? The free and publicly usable version of termino.gv.at does not require a contract processing agreement between companies or organisations that use TERMINO and the BMDW, as there is no relation in the sense of a responsible person according to Art. 4 Z 7 GDPR and a contract processor according to Art. 4 Z 8 GDPR, due to lack of purpose and means. How can I print a list? What do I need to consider before printing a voting list? How can I export a list of participants? Is there an export function? TERMINO has no export function of its own, because there is no need for it. If you want to export the list of participants to a table, simply mark the whole table in your web browser and paste it into Excel or Calc. Sometimes you are asked for the preferred language of the fields, so just select e.g. English. How long for will appointments be available? Can I delete them myself? Agreed appointments are deleted three months after the fixed date, uncompleted appointments six months after their creation. In terms of the Basic Data Protection Regulation, these periods are a compromise between service orientation and data economy. As an appointment creator, you can also delete an appointment by yourself on the "Edit" page below. Can polls have a "maybe" option additionally to "yes" and "no"? Yes. When creating a poll, expand the SETTINGS. There you can enable the "Maybe" option.